"How Much Do Looks Matter When Landing a Job?" Dr. Shelton was awarded the RealSelf 100 Award for the second consecutive year, putting him in the top 2% of 6,000 physician members! Dr. Ronald Shelton at New York Aesthetic Consultants was again named, one of the Best Doctors in New York – and was also recognized in New York Magazine's annual Best Doctors 2013 issue which recognizes the best of the best from this list. 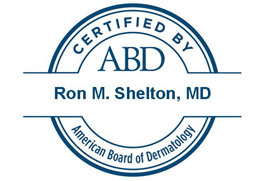 2011 Top Doctor Award - Ronald Shelton, MD for Botox, Fraxel laser, CoolSculpting, Ultherapy, Radiesse and Fat transfer. "Wrinkles are not from age, 95% of them are sun-related," says New York City dermatologist Ron Shelton, MD. We are proud to announce that Dr. Shelton has again been named one of the Best Doctors by New York Magazine. This prestigious award is voted on by over 12,000 medical professionals in New York City, Westchester Country, Long Island and portions of New Jersey and Connecticut.